While F/O George Graham, F/O Harry Smith and F/S T.J. Bright along with Sgt. Martin (later Pilot Officer)eventually made the long trip back to Britain. 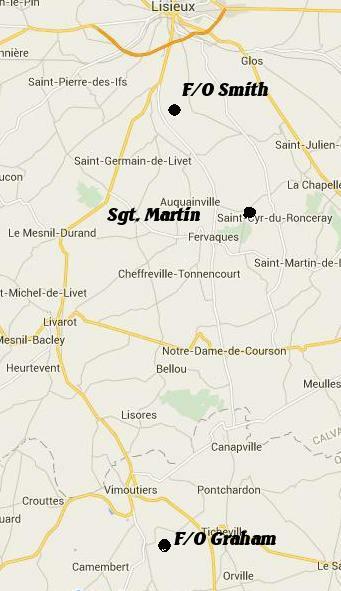 Sergeant Martin's journey began with his landing North East of Fervaques. The landing was not complete as he had become snagged in a tree branch 30 feet above the ground. After almost an hour of trying to free himself he tried once more at pulling on the parachute riser cords. This time he it worked and the parachute was dislodged from the branch bringing Martin down hard on the ground. He hit his head and was unconscious for a short time, but sustained no injuries from the final drop to the ground.. The disposal of his gear came next then a quick look around before deciding on crossing a pasture nearby. The pasture was not as empty as he had thought. The size and looks of the bull he found made the decision to get out of the field an easy one. He stayed close to the edge of the forest now until he reached a small country road. he carefully crossed the road and continued on. His path took him to the River Touques, he swam across to the West side, climbed a small hill to scout out his next direction. The fields he saw to the West were wet and marsh like which would make the walking slow and tiresome. He re-crossed the river back to the East bank, again in full uniform less the one boot lost in escaping the Halifax. Heading south and avoiding the roads he came to the outskirts of Fervaques. He circled the village on the West side and came to a cross roads South of the village. Martin decided to continue South on this road. Rain was now falling on his uniform which had been water logged from the two swims. The energy he had used in the walking and swimming was catching up with him after a mile he crossed a field to house he saw faintly from the road. As he hid from sight he saw a women waving goodbye to a departing visitor. The woman stayed at the window, Martin caught her attention and via signs and gesturing asking if the road was clear to cross. He was fortunate; the woman took him into her house. She then went and brought back another man. This man led Sgt. Martin off to a place of concealment, where he was looked after. In time he was in the hands of an organization who then led him over the Pyrenees through Spain and then on to Gibraltar. Arriving back in Britain about mid-January 1944.